I made the glacier walk! With my ankle taped to within an inch of its life and the help of an ankle brace I was able to make it to the glacier and back without a problem. No one mentioned I was going to have to walk up 550 steps to get there, but I guess that is for the best because I am not sure I would have agreed to it. It was worth it once we got to the glacier. 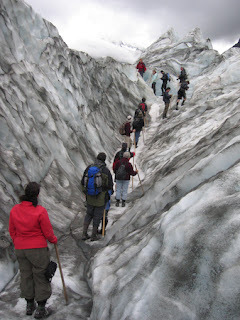 We spent a good amount of time hiking up and down though ice canyons and along the top of the glacier. I learned a lot about glaciers and the eco system of NZ. Our half day hike was at Fox Glacier which is on the south island. Apparently the glacier is constantly moving up and down the same valley constantly growing and shrinking. In the process it wipes out all the greenery in its way leaving bare rock. An orange algae forms on the rock which makes it possible for other plants to get a hold and before you know it (ok, it takes years) you have greenery all over. Oh! And I got to wear crampons!